Johns Hopkins engineers created a computer model to predict the increasing vulnerability of power grids in major coastal cities during hurricanes. By factoring historic hurricane information with plausible scenarios for future storm behavior, the team could pinpoint which of 27 cities, from Texas to Maine, will become more susceptible to blackouts from future hurricanes. 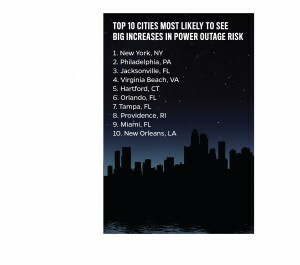 Topping the list of cities most likely to see big increases in their power outage risk are New York City, Philadelphia, Jacksonville, Fla.; Virginia Beach, Va.; and Hartford, Conn. Cities at the bottom of the list, whose future risk of outages is unlikely to dramatically change, include Memphis, Dallas, Pittsburgh, Atlanta and Buffalo. Seth Guikema, an associate professor in the university’s Department of Geography and Environmental Engineering, said his team’s analysis could help metropolitan areas better plan for climate change. Although planning for climate change is difficult due to the high degree of uncertainty about how hurricanes of the future will behave, the team examined a range of potential changes in hurricane activity and quantified how those changes are likely to influence power outage risk. By being able to anticipate these risks, officials have a chance to protect cities against damage and to reinforce their power grids, he said. The research appears in the December issue of the journal Climatic Change. Johns Hopkins doctoral student Andrea Staid is the report’s lead author. Not surprisingly, the team’s results depend strongly on location. If climate change indeed intensifies hurricane activity, some areas of the country would feel the impact of it more than others. Cities already in the eye of the storm like Miami and New Orleans would remain so. But cities like New York City and Philadelphia as well as some more inland urban areas would likely be increasingly susceptible to more frequent and intense storm activity, the team found. For both New York City and Philadelphia, the 100-year storm scenario, that is, the level of storm impacts expected to be exceeded on average once every hundred years, would be 50 percent higher. More people would lose power more often, and the worst storms would be substantially worse. In that same type of 100-year storm situation, the researchers predict about a 30 percent increase in the number of customers without power in Miami and New Orleans relative to current climate conditions. In more geographically protected cities like Baltimore and Washington, D.C., there would be about a 20 percent increase in the number of customers without power in the 100-year storm. The research was funded in part by the National Science Foundation grants 1149460, 1215872, 1331399 and 0968711.